Many of the quality of life indicators have improved in Latvia during the years of observation in Eurofound’s European Quality of Life Survey (EQLS). For instance, life satisfaction has increased from 5.6 in 2003 to 6.3 in 2016 (on a scale of 1–10). Similarly, happiness increased from 6.5 to 7.0 during the same period. Furthermore, the share of people reporting difficulties in making ends meet in Latvia has decreased, from 73% in 2003 to 53% in 2016. In 2016, 45% of respondents in Latvia reported that they felt free to decide how to live their lives, which was significantly higher than the EU28 average of 26%. Furthermore, respondents in Latvia were more optimistic about their own future and their children’s or grandchildren’s future than the average in the EU. Work–life balance related problems are relatively more frequent in Latvia in comparison to the EU28 average. For instance, 66% of respondents reported being too tired from work to do household jobs at least several times a month in 2016, compared with the EU28 average of 59%. Similarly, 47% of respondents reported difficulties in fulfilling family responsibilities because of work, higher than the EU average of 38%. Regarding the third work–life balance indicator, 29% of respondents in Latvia said they found it difficult to concentrate at work because of family responsibilities at least several times a month in 2016, which was 10 percentage points higher than the corresponding EU average of 19%. The Social Exclusion Index has improved in Latvia from 2.4 in 2011 to 1.9 in 2016 (on a scale of 1–5 where a lower rating means lower social exclusion). This is also better than the respective EU28 average of 2.1 in 2016. Another very positive indicator is the share of people who feel safe when walking alone after dark, which stood at 40% In Latvia in 2016, higher than the EU28 average of 35%. Trust in people has fluctuated in Latvia. The level decreased from 5.0 to 4.0 between 2003 and 2007, stood at 4.1 in 2011 and has increased since then to 4.5 in 2016 (on a scale of 1–10). Trust in people in Latvia is lower than the respective EU28 average of 5.2 in 2016. Many of the quality ratings for public services have remained fairly stable in Latvia during the years of observation in the EQLS. For instance, the perceived quality of the education system has continuously ranked at 5.9 between 2003 and 2016 (on a scale of 1–10). However, the perceived quality of public transport has increased from 6.5 in 2011 to 7.1 in 2016, which is also higher than the EU28 average of 6.6 in 2016. The state pension system in Latvia received the lowest perceived quality rating of 3.6 in 2016, being also lower than the EU28 average of 5.0, and close to the 2.6 rating in Greece, the lowest rating for the quality of state pension system in the EU. This profile describes the key characteristics of working life in Latvia. It aims to complement other EurWORK research, by providing the relevant background information on structures, institutions and relevant regulations regarding working life. This includes indicators, data and regulatory systems on the following aspects: actors and institutions, collective and individual employment relations, health and well-being, pay, working time, skills and training, and equality and non-discrimination at work. The profiles are updated annually. On 6 October 2018, the new Latvian parliament (Saeima) was elected. Of 100 parliamentarians, only 34 were re-elected, while the remaining 66 were new members. With none of the seven elected political parties having a large representation in parliament, the new Saeima struggled to form a coalition and approve the new government. The new government was finally approved on 23 January 2019. The Partnership of Latvian Construction Entrepreneurs proposed sector-level collective bargaining as a means of solving problems with the shadow economy in the sector. It is unusual in Latvia for an employer organisation to be the initiator of social dialogue activities. The process was supported by the largest construction firms, the Latvian building sector trade union and national-level social partners. Also unusual was the agreement by national-level social partners that sectors where sector-level collective wage agreement is concluded might receive additional benefits. As part of negotiations in the construction sector, partners agreed on changes to pay for overtime work. As a result, the general wage agreement in the sector was signed, with the precondition that it would become valid when amendments to the Labour Law regarding pay for overtime work were adopted. The Cabinet of Ministers approved the necessary changes in law, but amendments were unexpectedly rejected by the president. On 3 December 2018, another player stepped in and, in an official letter, the European Federation of Building and Woodworkers asked the Latvian parliament to support the sectoral-level collective agreement for the construction industry. The outgoing government decided to leave it to the new government to continue the process. Reforms in the healthcare sector were high on the agenda for all in Latvia. Under the new Healthcare Financing Law approved in 2017 (due to come into force from 2019 with 2018 as a transition period) there are two types of healthcare ‘baskets’: one for those who make social contribution payments and another for those who do not. Employer organisations and a number of doctors strongly opposed the introduction of such a system while the Trade Union of Health and Social Care Employees of Latvia (LVSADA) supported the reform on the basis that it would bring about stability in the financing of healthcare. Meanwhile, following a complaint made to the Ombudsman, the Constitutional Court ruled that specific norms governing overtime for medical workers should be abolished. This ruling raised tensions in different parts of the healthcare sector, as it limited scope for employers to cover workforce shortages and for employees to boost low incomes through working more overtime hours. After heated discussions, the LVSADA, the Latvian Hospital Association and the Ministry of Health agreed that medics could work 16 overtime hours a week – twice as much as other professionals – during the next three years. Social dialogue as a method has made contributions to the main areas of working life. More generally, social partners have assumed the role of ‘watchdogs’ in the social arena, ensuring that decisions are more or less acceptable to both employers and employees. Social dialogue is being strengthened by better funding and knowledge exchange afforded by international projects. The impact of the EU level is important in promoting capacity-building among the social partners, whereas its impact on national industrial relations is insignificant. No important working life regulations were passed in 2018. Between 2012 and 2017, there was some considerable growth in GDP (20.6%), well above the EU average for the same period (7.4%). In the five-year period, unemployment rates decreased for all categories, especially youth unemployment (down 11.5 percentage points). Total unemployment stood at 8.7% in 2017, above the EU average for that year (7.6%). In the five years considered there was growth in employment figures for most categories, the highest for men (2.7 percentage points), with the total employment rate at 79.8% in 2017, whilst the EU average for that year was 78.9%. Labour legislation includes the Labour Law (adopted on 20 June 2001), Labour protection law (adopted on 20 June 2001) and supplementary legislation (more than 30 normative acts, adopted in different years), the full list of which is available at the Ministry of Welfare website, Labour dispute law (adopted on 26 September 2002), Strike law (adopted on 23 April 1999), and several normative acts regulating pay for special groups of workers and other specific issues. Employers’ representation, employees representativeness and collective bargaining is regulated by the Labour Law, Trade Union Law (new version adopted on 6 March 2014) and the Employers’ organisations and their association’s law (adopted on 19 May 1999). 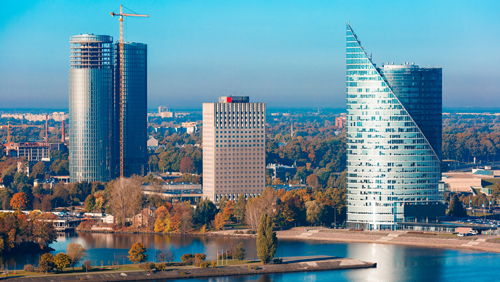 A Law on information and consultation of workers in EU-level commercial companies and groups of European- level commercial companies, adopted on 19 May 2011, determines the role of European works councils. A law on aid for the activities of start-up companies, including a special personal income tax regime for start-ups, was also introduced in 2016. The social dialogue system was established at the beginning of the 1990s, when the role of trade unions, employer organisations, collective agreements and procedure of negotiations was set out in the Latvian Labour Law and other specific laws. The system is based on the principle of voluntary participation of its actors. In the beginning, social dialogue was a bipartite process. In 1993, a social dialogue system was established in Latvia based on a tripartite negotiation process. In 1993, two tripartite councils were established and in 1994 one more council was established. Employees were and still are represented by a single national level organisation, the Free Trade Union Confederation of Latvia (LBAS), and employers also are represented by a single organisation, the Latvian Employers’ Confederation (LDDK) (established in 1993). The National Tripartite Consultative Council of employers, the government and trade unions was established in December 1993. It was reorganised into the National Tripartite Cooperation Council (NTSP) in 1996. On 12 May 1998, based on the ‘Conception on tripartite cooperation at national level’ particular councils were amalgamated into one main council and several sub-councils. A number of laws were introduced to regulate the social dialogue process. In 2002, new Labour Law was introduced, which set out more clearly the main principles of social dialogue, obligations of employers and rights of employees. Since the reorganisation of the social dialogue system in 1998, there have been no significant changes. The industrial relations are corporate and consensus-oriented, strong, concerted and tripartite oriented at national level, but weak at sector level. On 23 November 2016, the government adopted amendments to the law on personal income tax, which set out that the costs of catering for workers that is paid by employer according to the collective agreement are excluded from the taxpayers’ taxable income up to an amount not exceeding €480 per year (€40 per month on average) if the employer fulfils six requirements. If an employer is part of a group and the collective agreement relates to the entire group, exemption relates to the entire group. Exemptions do not relate to employers that are public entities of the state or local government, or to public–private companies. In 2017, the representativeness of employers in the sector level social bargaining was expanded to large enterprises through an amendment to the Labour Law. Such large enterprises should meet the same representativeness arrangements that are in place for the employers’ organisations. Trade unions, employers’ organisations and public institutions play a key role in the governance of the employment relationship, working conditions and industrial relations structures. They are interlocking parts in a multilevel system of governance that includes the European, national, sectoral, regional (provincial or local) and company levels. This section looks into the main actors and institutions and their role in Latvia. The highest institution involved in regulating of working life is the general legislative body, the Latvian Saeima and its Social and Employment Matters Committee. Part of legislation is adopted in the Cabinet of Ministers. Before adoption in the Cabinet of Ministers, normative regulations are discussed at corresponding Committees of Cabinet of Ministers, Meetings of the State Secretaries and intergovernmental working groups. Social dialogue and working conditions are the direct responsibility of the Ministry of Welfare. Within the ministry the Social Policy Planning and Development Department, Labour Relations and Labour Protection Policy department, Labour Market Policy Department and International Cooperation and EU Policy Department draw up proposals for employment policies and normative regulation of working life, and supervise implementation of adopted normative regulation. The Ministry of Welfare has two executive institutions directly dealing with the labour market – the State Employment Agency (NVA) and the State Labour Inspectorate (VDI). The NVA deals with employment promotion and unemployment issues. The main duty of VDI is state supervision and control over compliance with the normative regulation in employment legal relations and work protection spheres. This institution also monitors and promotes health and safety at work. The State Labour Inspectorate cooperates with the Riga Stradins University Institute for Occupational Safety and Environmental Health which collects and maintains a database on occupational diseases. Operation of the VDI is regulated by legislation. Labour courts do not exist in Latvia. At national level, employers are represented by a single employers’ organisation, the Latvian Employers’ Confederation (LDDK) and employees are represented by a single trade union organisation, the Free Trade Union Confederation of Latvia (LBAS). This representation is set forth in the ‘Conception of Tripartite Cooperation’ that was approved in the Cabinet of Ministers in 1998, Statutes of the National Tripartite Cooperation Council (NTSP) and confirmed in a tripartite agreement among the Cabinet of Ministers, LBAS and LDDK, signed on 1 October 2004. The rights and obligations of social partners are set forth in the Trade Union Law and The Employers’ Organizations and Their Associations Law. Principles of representativeness in labour relations are set forth in Part Two of the Labour Law. The Trade Union Law (Section 4) states that everyone has the right to establish freely a trade union, without any discrimination, and not to join a trade union. Section 8 of the Labour Law regulates trade union membership for working citizens. Employees and employers have the right to unite freely, without any direct or indirect discrimination and to join organisations to defend their social, economic and occupational rights and interests and receive the benefits provided by such organisations. Affiliation with the organisations or the desire to join such organisations may not serve as a basis for refusal to enter into an employment contract, for termination of an employment contract or for otherwise restricting the rights of an employee. Some categories are excluded from the right to establish and to join trade unions. These are: individuals who are not residents of Latvia; pensioners; unemployed; employees of the Constitution Protection Bureau, Defence Intelligence and Security Service and the Security Police; soldiers; border guards. However, working trade union members are not obliged to leave the trade union if their status changes to student, unemployed or pensioner. State police workers have their own trade union. Section 16 of the law on trade unions (adopted in 2014) sets out that trade union interests at national level in relations with the Cabinet of Ministers must be represented by the trade union association that unites the largest number of workers in the country. Moreover, trade union interests in relations with the state and local government institutions at sector or profession level or at the level of the administrative territory should be represented by trade union that is member of the trade union association uniting the largest number of workers in the country. However, the law permits state and local government institutions to collaborate with other trade unions and their associations if necessary. Trade union density in Latvia is in decline. The number of trade union members in LBAS member organisations that are the main trade unions at sector level fell from 625,000 in 1992, to 92,174 in 2016. At the same time, the number of employees has fallen from 1.35 million in 1992 to 0.86 million in 2016. Trade union density, calculated as the proportion of the total number employees who are union members, was 46% in 1992, had declined to 27% in 1994, and declined further to 10.7% in 2016 (data from the Central Statistical Bureau of Latvia (CSP) and LBAS). Data on trade union membership are not officially collected in Latvia. LBAS has its own dataset, but it does not cover all trade unions and as responses are voluntary and not verified, the reliability of data is not appropriate for international comparison. LBAS affiliates are detailed in the table below. In 2016, trade union membership in LBAS affiliates decreased by 2746 persons compared with the figures for 2015. In some traditional trade unionist sectors, such as industry, membership decreased in 2012 to just 4,226 members. In 2013, when the largest metallurgical enterprise Liepajas Metalurgs was almost closed, Latvian Industrial Workers Trade Union (LIA) lost 694 members. The decline has continued. In 2014: the trade union lost 102 members and in 2015 it lost 215 members and its membership declined to just 3,187 in 2016 for a sector with more than 110 thousand employees in total. Trade unions seldom exist in retail trade companies – including those that are foreign owned – and small private companies. In some services sectors (such as inland water, hairdressing, personal services), trade unions do not exist. The number of members in affiliates of Trade Union of Commerce dropped from 31,900 people in 1992 to just 1,734 in 2016. LIZDA lost 195 members in 2013 and even more in the three following years, due to reforms in education and the closure of schools. Latvian legislation does not define rights, obligations or restrictions to membership of employers’ organisations or associations. The law states that an employers’ organisation is a public organisation established by at least five employers which represents and protects the economic, social and professional interests of its members, and other interests that conform to the objectives and functions of the employers’ organisation. Members of an employers’ organisation may be individuals or legal persons who, on the basis of a contract of employment, employ at least one employee. An association of employers’ organisations may be established if at least three employers’ organisations unite. An employer who is not a member of an employers’ organisation may also be a member of an association of employers’ organisations if on the basis of a contract of employment it employs at least 50 employees. Associations of employers’ organisations and large enterprises that fulfill representation arrangements set by the Labour Law are eligible to represent employers at sector level negotiations. Despite the good design of the representation system, it is rare for employers’ organisations to be involved in collective bargaining, even if they are members of the national level employers’ organisation LDDK. LDDK strives to increase its membership, and there is increasing participation of such quasi-employers' organisations (these are not employers organisations by law and do not participate in collective bargaining). Relevant data on membership of employers’ organisations is not available. Employers’ organisations do not monitor density. The table below is compiled from data obtained in the homepages of LDDK members, but it relates to member organisations, of which not all are employer organisations by law, and, at the same time, does not cover all organisations that are established by employers. As precise calculation of the membership has not been done, it is not possible to have development trends over past 10 years. It is known that the membership of LDDK ihas increased in terms of the number of members, while the coverage and density in terms of employees is not clear. Compulsory membership is not established. LDDK is the most important employers’ organisation, a single national-level employer representative, established exclusively for social dialogue purposes. It reports that its members employ 44% of the total number of employed in Latvia (in 2017). 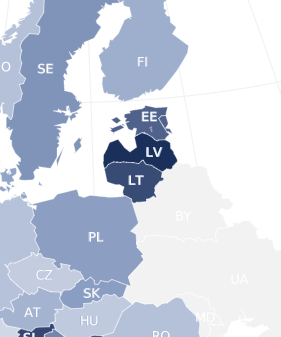 The Latvian Chamber of Commerce and Industry (LTRK) represents employers at national level and participates in social dialogue, but is not an employers’ organisation as stipulated by law. 64 sector and regional associations and federations covering more than 5,000 enterprises in total, of which 3,036 are micro and small enterprises. The main tripartite body is the National Tripartite Cooperation Council (Nacionālās trīspusējās sadarbības padome, NTSP). Its operation is regulated by the Statutes of NTSP (adopted on 30 October 1998). According to its Statutes, NTSP is formed on principles of parity from representatives of the Cabinet of Ministers (the government), LDDK and LBAS. In compliance with the Statutes, NTSP examines policy planning documents and drafts on normative acts and sets out proposals for their improvement in the following areas: social security; guidelines of the state budget; strategy of economic and regional development; health; development of general and vocational education; employment, classification of occupations; implementation of international commitments. The NTSP is a two-stage discussion platform: at the first stage discussions are carried out in the commissions, and second stage discussions are in the NTSP main body. The executive body is the Secretariat. Initially the Council and its Secretariat was operated by the Ministry of Welfare, but later the legal status of the Council was elevated so that it is directly subordinated to the President of Ministers. Consequently, the Secretariat now is operated by the State Chancellery (VK). The secretary of the Council is subordinated to the State Chancellery in institutional matters and to President of Ministers in functional matters. Meetings of the Council are organised on request, but at least once every two months. Institutional regulation and work organisation of the NTSP has not changed within the last three years. There are some bodies, such as consultative councils and working groups, where social partners must be invited, but these are not created specifically for social dialogue purposes. An example of such an organisation is the Council of Economy and its committees, where LDDK and LBAS are represented in the main council, and in committees. National-level social partners LBAS and LDDK have concluded one tripartite cooperation agreement in 2004 and three mutual cooperation agreements – in 1994, 2007 and 2013 (valid until 2020), aimed at the creation of a favourable economic environment and social peace. Issues that concern employers and employees. authorised employee representatives who have been elected in accordance with the Labour Law. Employee representatives are bound to defend the social, economic and occupational rights and interests of employees. Trade unions may be established in compliance with the Trade Union Law. The law does not define thresholds for membership. It is defined in statutes of existing trade unions, that not less than three persons may establish a trade union organisation. Authorised employee representatives may be elected if an undertaking employs five or more employees. The Labour Law does not require the appointment of an employee representative for information and consultation, but it provides for convenient information and consultation procedure. The law allows one or several employee trade unions and an indefinite number of trade unions and authorised employee representatives in one enterprise, but requires that all existing employee representatives are authorised for joint negotiations with an employer in proportion to the number of people they represent, but not less than one representative each. The law requires that employee representatives express a united view with respect to the employer in cases where: several representatives are elected; representatives of several trade unions have been appointed for negotiations with an employer; representatives of one employee trade union or representatives of several such trade unions and authorised employee representatives have been appointed for negotiations with an employer. The Law on the information and consultation of workers in EU-level commercial companies and groups of EU- level commercial companies regulates the right to establish and operate European works councils. Voluntary, at least three workers. Voluntary, five or more people. Law on information and consultation of workers in EU-level commercial companies and groups of EU-level commercial companies. Should be established for information and consultation of workers in EU-level commercial companies and groups of EU-level commercial companies or other employee representatives used for this purpose. In the figure, we see a comparison between Latvia and European Union for the people with 'Establishment size : All' when asked 'Official structure of employee representation present at establishment'. For the 'Yes' answer, Latvia's score is lower than the European Union score. For the 'No' answer, Latvia's score is higher than the European Union score. The National comparisons visualisation presents a comparative overview for the values of all answers between two selected countries. Latvia’s low score for 'Yes' and higher score for 'No' regarding the question about employee representation at establishment in category 'All sizes' might be explained by the enterprise structure of the national economy. In 2015, 93.7% of all registered economically active enterprises were micro-enterprises (1-9 employees), where the average number of employees is less than 5, and the need for employee representation is not evident. 3.3% were small enterprises (10 – 19 employees) where establishing of employees representation also is not typical. The central concern of employment relations is the collective governance of work and employment. This section looks into collective bargaining in Latvia. Collective bargaining is regulated by Part B of the Labour Law (Section 17 – Section 27). The law describes the content and form of collective agreements, parties to a collective agreement, effect of collective agreements over time, effect of a collective agreement on workers, procedures for entering into a collective agreement, approval of a collective agreement, amendments to provisions of a collective agreement, familiarisation with a collective agreement, and settlement of disputes. A collective agreement is a voluntary instrument, but is binding on all involved parties once it is concluded. Changes in collective agreements should be agreed by all involved parties. Collective bargaining is voluntary, usually initiated by trade unions. It has neither increased nor decreased in recent years. Sector level collective bargaining is weak. Wage bargaining coverage is not monitored at national level. It can be roughly characterized by using data from the annual LBAS survey, but, as described before, this data is collected on voluntary basis and is not perfect. In 2016, 1,152 collective agreements were concluded by LBAS affiliates. In 2015, trade unions were established in 1,990 enterprises. The main level of collective bargaining is company level. Efforts by social partners have been focused on developing of sectoral and regional social dialogue institutions, but without any success. In Latvia collective agreements are not distinguished by wage agreements and working time agreements. Collective agreements usually include a wider scope of issues but do not tackle issues of wages and working time, because these issues are sufficiently regulated by the law. Regarding working time, most typically collective agreements provide more holidays or time for education. Note: *Wage and working time issues are negotiated at national level, but do not result in collective agreements. The highest standard for employment relations is law. Any collective agreement may only improve conditions set by law and by the highest level collective agreement. Since sector level agreements almost do not exist in Latvia, company level agreements must provide better conditions than the whole scope of labour legislation. Collective bargaining may be carried out at any time and collective agreements may be concluded at any time. Negotiations on the national minimum wage between the government and national level social partners is conducted before adoption of the state budget, usually in August-September when statistical data on economic development for the first half of the year are available. Official wage bargaining coordination is not established. Informal coordination also is not developed. There is only one sector level collective agreement (identified as ‘General Agreement) , in the railway sector. In 2016, discussion took place regarding concluding the general agreement in the construction sector, but agreement has not yet been reached. In some sectors, trade unions and employers organisations have concluded cooperation agreements that are similar in terms of format and wording. LBAS and LDDK organise measures for improving sector level social dialogue, but these efforts have a capacity- building rather than a coordinating purpose. In compliance with Latvian law, a general agreement entered into by a large enterprise, an employer organisation or an association of employer organisations is binding on the members of the organisation or the association of organisations. If an enterprise or organisation or an association of employers’ organisations concluding an agreement employs more than 50% of the employees or provides more than 60% of the turnover in a sector, a general agreement is binding on all employers of the relevant sector and applies to all their employees. A company level collective agreement is binding on the parties and its provisions apply to all employees who are employed by the relevant employer or in a relevant undertaking of the employer, unless provided for otherwise in the collective agreement. It shall be of no consequence whether legal employment relationships with the employee were established prior to or after the coming into effect of the collective agreement. Other voluntary mechanisms of extension application of the terms of collective agreements do not exist. The Labour Law states that ‘an employee and an employer may derogate from the provisions of a collective agreement only if the relevant provisions of the employment contract are more favourable to the employee’. The legal way to derogate from the existing collective agreement is by amending the provisions of a collective agreement. Section 23 of the Labour Law determines the mechanism of amendments to provisions of a collective agreement. The law states that during the period of validity of a collective agreement, the parties may amend its provisions only in accordance with procedures prescribed by the collective agreement, or with the procedures of establishing of collective agreement (Section 21 of the Labour Law) if such procedures have not been prescribed. or notice of termination by one party if such a right has been agreed upon in the collective agreement. Section 16 (3) of the Labour dispute law stipulates that if a collective interests dispute is tackled by using the conciliation method, parties should refrain from the collective action (including strike or lock-out. The same requirement is valid if the collective dispute is tackled by the court of arbitration (Section 20 (5)). Section 14 (2) of the Strike Law sets out that during the strike the trade union or employees are not allowed to state to the employer the demands which have not been indicated in the declaration of a strike. additional measures for older workers. The right to strike and the procedure is established in the Strike Law. The Labour Dispute law regulates the procedure for resolution of labour disputes prior to strikes or, if unsolved, the justification for a strike. The Strike Law defines a strike (streiks) as a means of resolving a collective interest dispute that manifests itself so that employees or a group of employees of a branch of an undertaking voluntarily, completely or in part, discontinue work to attain the fulfilment of their demands. The employees have the right to strike to protect their economic or professional interests. The right to strike shall be exercised as a last resort if no agreement has been reached in the collective interest dispute. Participation in a strike has to be voluntary. Judges, prosecutors, members of the police, fire-protection, fire-fighting and rescue service employees, border-guards, members of the state security service, warders and persons who serve in the National Armed Forces are all prohibited from striking. Other legal types of industrial action are labour disputes (darba strīds) and dispute resolution mechanisms, las well as lockouts (lokauts) (governed by the Labour dispute law). Trade unions may also call for protest actions such as meetings (mītiņš), pickets (pikets) and demonstrations (demonstrācija) (regulated by the Law on meetings, pickets and demonstrations , adopted on 16 January 1997). Strikes are rare in Latvia. Still, according to ILO data, in 2015 there were 250 strikes and lockouts, involving 23,000 people. Some 22,018 days were not worked due to strikes and lockouts (25.4 days per 1,000 workers). Of these, 249 incidents took place in the education sector (and one in the arts, entertainment and recreation sector). National statistics on industrial action is not published in Latvia. CSP may prepare data from a “Survey of economically active commercial companies, individual merchants, peasant or fisherman farms, budgetary institutions, foundations, associations of funds”, as well as administrative data on request. This data is submitted to ILO and published in ILO dataset. General principles of the dispute resolution mechanisms are set out in the Labour Law. Depending on the object of a dispute and persons involved, labour disputes are divided into individual disputes regarding rights, collective disputes regarding rights and collective disputes regarding interests. In settling individual and collective disputes regarding rights, the Labour Law and the Civil Procedure Law is applied. In settling collective disputes regarding interests, the Labour Law and the Strike Law is applied. Collective dispute resolution mechanisms in details are regulated by the Labour dispute law (Sections 9–21). The law distinguishes between collective disputes regarding rights and collective disputes regarding interests. The Labour Law determines dispute resolution regarding collective agreements. A collective dispute regarding rights is a difference of opinion between the involved parties that arises when concluding, altering, terminating or fulfilling an employment contract, and in applying or interpreting provisions of regulatory enactments, provisions of a collective labour contract or working procedure regulations. A collective dispute regarding interests is a difference of opinion between the involved parties that arise in relation to collective negotiation procedures determining new working conditions or employment provisions. In both cases the first step is submitting a submission in writing to the other party, setting out the demands being made. If the reply is negative or there is no reply, a collective dispute regarding rights shall be settled in a conciliation commission. Any party to a collective dispute regarding rights has the right to apply to the courts if it is not settled in the conciliation commission. If parties agree in writing, a collective dispute regarding rights may be transferred to an arbitration court for settlement. The Labour Law states that individual disputes regarding rights between an employee and an employer, if they have not been settled within an undertaking, shall be settled in court. The Labour Dispute Law defines an individual dispute regarding rights as a difference of opinion between an employee or group of employees and an employer arising when concluding, altering, terminating or fulfilling an employment contract, and by applying or interpreting the provisions of regulatory enactments, the provisions of a collective labour contract or working procedure regulations. Individual disputes regarding rights in an undertaking shall be settled as far as possible in negotiations between an employee and an employer. If an agreement between the employee and the employer has not been reached in negotiations, the employer and the representatives of employees have to agree in writing about establishing a labour dispute commission. The employer and the representatives of employees may also agree to apply other dispute settling procedures. Any party to an individual dispute regarding rights has the right to apply to the courts if it is not settled in negotiations between an employee and an employer, or if any of the parties is not satisfied with the decision of the labour dispute commission. Trade unions have the right to represent their members without special authorisation in the settlement of individual disputes regarding rights, and to bring an action in court in the interests of their members. There are no labour courts in Latvia. Labour disputes are settled by the ordinary court. There are no data available on how often alternative forms of dispute resolution are used as compared to the dispute resolution taking place in court. Individual employment relations are the relationship between the individual worker and their employer. This relationship is shaped by legal regulation and by the outcomes of social partner negotiations over the terms and conditions governing the employment relationship. This section looks into the start and termination of the employment relationship and entitlements and obligations in Latvia. the provisions of the collective agreement and working procedure regulations to be applied to employment legal relationships. It is prohibited to employ a person who is under 15 years of age or someone who is under 18 and in full-time education (identified as ‘children’) in permanent work. Children from the age of 13, if one of the parents (guardian) has given written consent, may be employed outside of school hours doing light in work not harmful to the safety, health, morals and development of the child. Such work is determined by the Cabinet of Ministers. Foreigners may be employed only if they have the right to be employed confirmed by visa or special permit (may be exceptions). Thus rule does not apply to citizens of the EU and those who have the right to free movement within the EU in compliance with Schengen Agreement. Dismissal and termination procedures are regulated by the Labour Law (Sections 100–112,Sections 113–129). The procedure starts with issuing or submitting notice of termination. The law describes in detail how and under what circumstances either party may issue notice of termination. It sets out the time period required for notice of termination by an employer, procedures for a reduction in the number of employees and collective redundancy, prohibitions and restriction to the dismissal and preferences for continuing employment relations in case of reduction in the number of employees, special requirements regarding member of trade union, assistance in seeking for new job and severance pay and other issues. An employee has the right to give notice in writing of termination of an employment contract one month in advance, unless a shorter time limit is provided for in the employment contract or the collective agreement. The law specifies 11 situations when an employer may give notice of termination: only on the basis of circumstances related to the conduct of the employee, his or her abilities, or of economic, organisational, technological measures or measures of a similar nature in the undertaking. An employer has a duty to notify the employee in writing of the circumstances that are the basis for termination of the employment contract. An employer is prohibited from giving a notice of termination of an employment contract to an employee who is a member of a trade union without prior consent of the relevant trade union. The length of parental, maternity and paternity leave is determined by the Labour Law (Sections 154–156). Parental, maternity and paternity leave are subject to the Latvian social insurance system that provides the allowances received during the leave. The relevant social benefits are available for socially insured persons if a person has made mandatory or voluntary social insurance contributions to the special social insurance budget (the law On state social insurance (Section 12(1),(2), adopted on 1 October 1997, valid from 1 January 1998). The amount of benefit depends on the total amount of person’s contribution and is calculated on the basis of persons’ social insurance salary. Pre-natal leave (before the birth) is 56 calendar days and maternity leave (after the birth) is 56 calendar days. These days are aggregated and maternity benefit is granted for 112 calendar days. They are not compulsory. In compliance with Latvian Labour Law (Section 37), an employer is not allowed to employ pregnant women two weeks before expected birth of a child and women two weeks after the birth. a) Supplementary leave of 14 days, added to the prenatal leave and amounting to 70 calendar days in total. b) Supplementary leave of 14 days, added to the prenatal leave and amounting to 70 calendar days in total. c) Supplementary leave of 14 days, added to the prenatal leave and amounting to 70 calendar days in total. 80% of the average insurance wage of the beneficiary. –Law on state social insurance (adopted on 1 October 1997). According to Article 156 of the Labour Law, every employee, both mother and father, has the right to parental leave in connection with the birth or adoption of a child. For a period not exceeding 1.5 years, it can be requested at any time up to the day the child reaches the age of eight years. Parental leave, upon the request of an employee, shall be granted as a single period or in parts. The employee has a duty to notify the employer in writing one month in advance of beginning parental leave of the duration of parental leave or parts thereof. An early termination of the parental leave and return to work shall be carried out according to the procedures stipulated by a collective agreement or an employment contract, based on an agreement between the employee and employer. The employee is entitled to return to work, subject to notifying the employer at least two weeks in advance, where due to objective reasons there is no reason for further need of childcare. – until the child reaches the age of 1.5 years – to the amount of 43.75% of the recipient’s average wage subject to insurance contributions. The amount of the benefit is determined on the basis of whether if the parent benefit recipient will be on leave for childcare reasons. The level of benefit depends on whether parents work or are on maternity leave. A beneficiary may chose the time of the benefit, and the amount of the benefit is calculated on the basis of the duration of parental leave. If the choice is made regarding the duration of receiving the benefit (until the child reaches the age of 1 or 1.5) and the benefit is granted, the chosen duration in case of the same child may not be changed. The father of a child is entitled to leave of 10 calendar days. This leave shall be granted immediately after the birth of the child, but not later than within a two-month period from the birth of the child. If a mother has died in childbirth or within a period up to the 42nd day of the postnatal period or, in accordance with the procedures prescribed by law up to the 42nd day of the postnatal period, has refused to take care and bring up the child, the father of the child shall be granted leave for the period up to the 70th day of the child’s life. The leave referred to shall be granted also to another person who actually takes care of the child. If a mother cannot take care of the child up to the 42nd day of the postnatal period due to illness, injury or other health-related reasons, the father or another person who actually takes care of the child shall be granted leave for those days on which the mother herself is not able to take care of the child. For a family that has adopted a child up to three years of age, one of the adoptive parents shall be granted 10 calendar days of leave. A child’s father, an adoptive parent or another person who cares for the child and who makes use of the leave referred to in this section shall have their job position kept for them. If this is not possible, the employer shall ensure similar or equivalent work with conditions and employment provisions that are not less favourable. Labour Law (adopted on 20 June 2001, valid from 1 June 2002). Law ‘On State Social Insurance’, (adopted on 1 October 1997, valid from 1 January 1998). Law ‘On Maternity and Sickness Insurance’, (adopted on 6 November 1995, valid from 1 January 1997). Regulation of the Cabinet of Ministers No. 270 on ‘Procedures for Calculation of Average Wage Subject to Insurance Contributions and Procedures for Granting, Calculation and Payment of State Social Insurance Benefits’ (adopted on 28 July 1998, valid from 1 August 1998). Regulation of the Cabinet of Ministers No. 152 on ‘Procedures for Issuance of Sick-Leave Certificates’ (adopted on 3 April 2001, valid from 1 May 2001). Law On Budget and Financial Management, (adopted on 24 March 1994, valid from 24 April 1994). Annual law ‘On the state budget for <relevant year>’ (budget law 2017 adopted on 24 November 2016, valid from 1 January 2017). Sick leave is paid from the social insurance budget. Long-term sick leave: sickness benefit shall be granted and disbursed at 80% of the average wage of the benefit recipient subject to insurance contributions from the 11th day of incapacity for work until the day the capacity for work is restored, but not longer than for 26 weeks, counting from the first day of incapacity for work if incapacity is continuous, or not longer than for 52 weeks in a period of three years if incapacity for work recurs at intervals (Section 13(1) of the law On State social insurance). Section 36 of the law On State Social Insurance states that an employer has a duty to disburse sick pay from his or her resources to employees who have incurred temporary incapacity for work, certified by a sick-leave certificate issued in accordance with the procedures prescribed by the Cabinet (except incapacity for work that is related to pregnancy and childbirth, and nursing a sick child). This should be not less than 75% of average earnings for the second and third days of temporary incapacity and not less than 80% from the fourth day of incapacity for work for a period not longer than 10 calendar days. An employer does not have the right to give notice of termination of an employment contract during a period of temporary incapacity of an employee, except special cases connected with unacceptable behaviour of an employee at work. The retirement age is determined by Section 11 of the Law on State Pensions (adopted on 2 November 1995, valid from 1 January 1996). Women and men who have reached the age of 65 years and who have a period of insurance not less than 20 years have a right to an old-age pension. A parent or guardian of a child who, during the time period until a child has reached 18 years of age, has taken care of five or more children for not less than eight years or of a disabled child for at least eight years can claim an old-age pension at age 60 if they have insurance of not less than 25 years. Persons whose length of period of insurance is not less than 30 years have the right to request an old-age pension two years before reaching the age of 65. Pay: For workers, the reward for work and main source of income; for employers, a cost of production and focus of bargaining and legislation. This section looks into minimum wage setting in Latvia and guides the reader to further material on collective wage bargaining. The national statutory minimum wage is established by the Labour law. The amount of minimum wage is determined annually for employees working normal working time (40 hours per week) by the Regulations of the Cabinet of Ministers. The main principles of the calculation of the minimum wage are set in the Conception on Determination of Minimum Wage, approved in the Cabinet of Ministers on 16 March 2011. Adjustments have been introduced in 2015 (calculation of minimum wage tied to fighting the shadow economy), and 2017 (calculation of minimum wage considered as a part of the tax reform aimed at reducing of inequality). The Ministry of Welfare prepares the proposal for a minimum wage in each budget period at the beginning of each year. The proposal is discussed between the government and social partners in the NTSP. The decision of the NTSP is indicative. Before 2015, the annual regulations of the Cabinet of Ministers established not only the minimum wage per month, but also the annual minimum hourly tariff, calculated as the minimum wage divided by the average number of working hours. Starting in 2016, the hourly rate for the minimum wage is not set; instead, the formula for its calculation is provided and should be used for calculating the hourly rate on a monthly basis. The Labour Law states that for teenagers and workers who are exposed to increased risk, normal weekly working time is to be considered to be 35 hours for the purposes of this calculation, making their minimum hourly tariff higher. Source: Relevant regulations of the Cabinet of Ministers of the Republic of Latvia. Collectively agreed pay is not established in Latvia. Company level collective agreements rarely include pay issues, and these outcomes are not reported and used for calculation of averages. Wages have not been agreed at sector level. Working time: ‘Any period during which the worker is working, at the employer’s disposal and carrying out his activities or duties, in accordance with national laws and/or practice’ (Directive 2003/88/EC). This section briefly summarises regulation and issues regarding working time, overtime, part-time work as well as working time flexibility in Latvia. Working time is regulated by the Labour Law (Section D). Regular daily working time of an employee may not exceed eight hours, and regular weekly working time may not exceed 40 hours. Daily working time means working time within a 24-hour period. Regular working time of employees associated with a special risk may not exceed seven hours a day and 35 hours a week if they are engaged in such work for not less than 50% of the regular daily or weekly working time. The Cabinet of Ministers may determine regular shortened working time also for other categories of employees. Normal working week means five working days. If due to the nature of the work it is not possible to determine a working week of five days, an employer, after consultation with employee representatives, may specify a working week of six days. Collective agreements may include regulations that are better than those set by law. Existing company level collective agreements include some specific regulations regarding working time, for instance, providing more holidays.. Overtime work is regulated by the Labour Law. Collective agreements and individual contracts may only improve the conditions set by law. Section 136 of the Labour Law defines overtime as work performed by an employee in addition to regular working time. Overtime work is permitted if the employee and the employer have so agreed in writing, or without written consent in exceptional cases: if this is required by the most urgent public need; to prevent the consequences caused by force majeure, an unexpected event or other exceptional circumstances; or for the completion of urgent, unexpected work within a specified period of time. If such overtime work continues for more than six consecutive days, the employer needs a permit from the State Labour Inspectorate for further overtime work. In 2014, overtime work was capped at 144 hours within a four-month period. Amendments to the Labour Law (adopted in 2014) changed this norm so that from 2015, overtime work cannot exceed eight hours on average within a seven-day period, calculated in a reference period that does not exceed four months. Section 68 of the Labour Law states that overtime work should be compensated for by not less than 100% of the hourly or daily wage rate or the piecework rate for the amount of work done. A collective agreement or an employment contract may specify a higher supplement for overtime work. Part-time work is regulated by Section 134 of the Labour Law. Part-time work is defined as a work for shorter time than the regular daily or weekly working time. An employer has, at the request of an employee, to transfer the employee from regular working time to part-time work, or vice versa if such working time arrangements are possible in the company. An employer has to give part-time work if requested by the following categories of employees: pregnant women, mothers up to a year after childbirth, for the whole period of breastfeeding up to a child’s second birthday, parents with a child of less than 14 years of age or a disabled child under 18 years of age. Full-time and part-time employees are covered by the same provisions. According to Eurostat Labour Force Survey statistics, the share of part-time workers aged 15–64 years decreased from 8.8% in 2012 to 7.5% in 2017, reaching the lowest figure of 6.7% in 2014. Figures for both men and women are well below the EU average. There are no special studies on the gender dimension of part-time work in Latvia, but Latvia is included in the EU-level report Gender equality and economic independence: Part-time work and self-employment. Review of the Implementation of the Beijing Platform for Action in the EU Member States . According to specialists from the Ministry of Welfare, the difference in part-time employment between women and men can be explained by differing goals regarding work–life balance, women being more often involved in family care. It may be added that provision by public institutions of childcare and care for older people appear not to be sufficient. Involuntary part-time work in Latvia is remarkable higher than EU average, but its share in total part-time work declines both for women and men so that it gradually approaches the EU level. At a hypothetical level, the reason for high share of involuntary part time work could be scarce availability of paid jobs at the labour market in general, and disproportion between the high qualification of workforce and labour demand for low qualified workers. Some impact is added also by the high share of the hidden economy. In compliance with the Latvian Labour law, night work is any work performed at night for more than two hours. Night- time with respect to adults is the period of time from 22:00 to 06:00. (With respect to children, it is the period from 20:00 to 06:00.). A night-worker is an employee who normally performs night work in accordance with a shift schedule, or for at least 50 days in a calendar year. In compliance with the Labour Law, an employer, after consultation with employee representatives, may determine shift work if it is necessary to ensure continuity of a work process. In such case, the length of a shift may not exceed the regular daily working time prescribed for the relevant category of employee. It is prohibited to assign an employee to work two shifts in succession. One shift may relieve (succeed) the other at the time specified by a shift schedule. The time worked by an employee after the end of a shift must be considered as overtime work. Transition from one shift to another must be organised in accordance with the procedures specified by a shift schedule, but not less frequently than weekly. An employer has a duty to familiarise employees with the shift schedules no later than one month before they come into effect. In compliance with the Labour Law, two days in a weekend are components of a week’s rest, if a working week of five days (normal working time) is specified for employees. If – due to the nature of the work – it is not possible to determine a working week of five days, an employer, after consultation with employee representatives, may specify a working week of six days. Work on Saturdays must end earlier than on other days. The length of the working day on Saturdays must be specified by a collective agreement, working procedure regulations, or by an employment contract. for the completion of urgent, unforeseen work within a specified period of time. It is prohibited to employ on the week’s day of rest persons who are under 18 years of age, pregnant women and women for a period following childbirth up to one year (but if a woman is breastfeeding then during the whole period of breastfeeding, but not longer than up to two years of age of the child). Rest time within the meaning of labour law is a period of time during which an employee does not have to perform their work duties and they may use at their own discretion. Rest time includes rest breaks during work, one-day rest, weekly rest, public holidays and leave. The length of a one-day rest in a 24-hour period shall be not less than 12 consecutive hours. This provision need not apply if aggregated working time has been prescribed. For children, the length of a one-day rest within 24 hours shall not be less than 14 consecutive hours. The length of a weekly rest period in a seven-day period shall not be less than 42 consecutive hours. This provision need not apply if aggregated working time has been prescribed. If a working week of five days is specified, an employee shall be granted two of the week’s days of rest, and if a working week of six days is specified, one of the week’s day of rest. Both of the week days of rest are customarily granted as consecutive days. Generally the week's day of rest shall be Sunday. If an employer determines one working day (that falls between a public holiday and the week’s days of rest) as a holiday and transfers it to the Saturday of the same week or of another week within the framework of the same month, the length of the week’s days of rest shall not be less than 35 consecutive hours. Every employee has the right to a break in work if their daily working time exceeds 6 hours. Adolescents have the right to a break in work if their daily working time exceeds 4.5 hours. Breaks shall be granted not later than four hours after the start of work, and it may not be less than 30 minutes in duration. The collective agreement may specify other procedures for the granting of breaks. If possible, an adolescent must be granted a break when they have worked for one-half of the daily working time contracted for. During breaks an employee has the right to leave the workplace unless otherwise provided for by the employment contract, the collective agreement or working procedure regulations. Any prohibition against leaving a workplace during breaks must be adequately substantiated. It is permitted to divide the break into parts, which may not be less than 15 minutes each. Employers must grant an additional break to employees who are exposed to special risk. An employee who has a child under 18 months of age must be granted additional breaks for feeding the child – not less than 30 minutes not less than every three hours for one child and at least one hour if an employee has two or more children under 18 months. When determining the procedure for granting a break, the wishes of the relevant employees shall be taken into consideration as far as possible. Breaks for feeding a child may be added to breaks in work or, if such is requested by the employee, transferred to the end of the working time thus shortening the length of the working day accordingly. In all cases, employers should determine the length of a break after consultation with employee representatives. All brakes envisaged by labour law are to be included as working time. Working time flexibility is provided for by the Labour Law. In compliance with the law, working time is a matter of an individual collective agreement. Better working time conditions may be agreed in collective agreement. if daily working time on any weekday is less than the regular daily working time, the regular working time of some other weekday may be extended, but not more than by one hour (the provisions of the length of weekly working time shall be complied with (Section 131 (2)). special working time regimes (part time (Section 134), overtime work (Section 136), night work (section 138), shift work (Section 139), aggregate working time (Section 140). In the figure, we see a comparison between Latvia and European Union for the workers with 'Age : All' when asked 'Do you have fixed starting and finishing times in your work?'. For the 'No' answer, Latvia's score is lower than the European Union score. For the 'Yes' answer, Latvia's score is higher than the European Union score. Data is based on question 39d from the sixth European Working Conditions Survey (2015).The National comparisons visualisation presents a comparative overview for the values of all answers between two selected countries. Maintaining health and well-being should be a high priority for workers and employers alike. Health is an asset closely associated with a person’s quality of life and longevity, as well as their ability to work. A healthy economy depends on a healthy workforce: organisations can experience loss of productivity through the ill-health of their workers. This section looks into health and safety and psychosocial risks in Latvia. Health and safety at work is addressed by the system of labour protection legislation, consisting of the Labour Protection Law and complementary legislation – 32 regulations of the Cabinet of Ministers. These regulations are divided into two groups. The first group regulates particular administrative procedures: labour protection requirements at the workplace; requirements regarding competent labour protection institutions and competent labour protection specialists at the workplace and procedure for assessment of competence; procedure for internal supervision of a working environment; procedure for obligatory health check; procedures, how accidents at work and occupational diseases should be investigated and reported; training in labour protection matters; training in providing the first aid and requirements for the minimum content of the first aid kit; procedure for election and operation of persons of trust in the labour protection matters. The second group sets out the safety requirements for work in specific conditions: protection against risks created by the electromagnetic fields, working with VDUs, risks of optical radiation, vibration and noise at workplace; safety and health requirements regarding exposure to cancerous substances, chemicals and biological substances; safety and health requirements when working at heights, in forestry, in construction, in mining, working with asbestos, working in explosive environment, carrying heavy things; requirements for safety and health protection at work and medical assistance on ships in general and fishing vessels in particular; labour protection requirements when using work equipment, individual protection means and regarding security signs. According to the Eurostat data, the total number of accidents at work and number of accidents at work decreased during the financial crisis in 2009 and 2010, but has increased again since 2011. In 2011–2015, the number of accidents at work per 1,000 workers has increased, contrary to the situation in the EU where the number of accidents at work per 1,000 workers has been steadily decreasing. However, the number of accidents at work per worker is almost ten times less than the EU average. In 2014, for which full data is available, the Latvian indicator was the fourth lowest in the EU (after Bulgaria, Greece and Romania). Source: National data from VDI. According to the Annual Reports of VDI, the number of accidents at work is higher than Eurostat data. Psychosocial risks at work are addressed in the labour protection legislation. The purpose of the main Labour Protection Law is to guarantee and improve safety and health protection of employees by determining obligations, rights and mutual relations regarding labour protection between employers, employees and their representatives, and state institutions. Special legislation regarding psychosocial risks does not exist. However general labour protection norms regarding risk assessment, approved labour protection measures, mandatory labour protection system at enterprise are aimed at reducing psychosocial risks at work. The main orientation in the prevention of psychosocial risks at work is the setting up of informative campaigns and guidelines for dealing with such risks. In the figure, we see a comparison between Latvia and European Union for the workers with 'Age : All' when asked 'Do you have enough time to get the job done?'. For the 'Always or most of the time' answer, Latvia's score is higher than the European Union score. For the 'Rarely or never' answer, Latvia's score is lower than the European Union score. For the 'Sometimes' answer, Latvia's score is lower than the European Union score. Data is based on question 61g from the sixth European Working Conditions Survey (2015).The National comparisons visualisation presents a comparative overview for the values of all answers between two selected countries. Skills are the passport to employment; the better skilled an individual, the more employable they are. Good skills also tend to secure better-quality jobs and better earnings. This section briefly summarises the Latvian system for ensuring skills and employability and looks into the extent of training. The Ministry of Economics is responsible for skills identification in the medium and long term. The Ministry maintains the long-term labour market forecasting system. NVA is responsible for short-term forecasting for the labour market. The Ministry of Education and Science is responsible for skills development, validation and recognition. The Ministry of Welfare (via NVA) is responsible for the training and re-training of the unemployed. Skills development and employment promotion policy is based on life-long learning and assistance in career development. Social partners are involved in ensuring skills and employability by participating in the drawing up of education policy, reforms in education and the setting up of professional standards. LBAS conducted a study on employability in 2014. LDDK has permanent expert in education, technology and innovation issues who participate in the management of skills, learning and employability at national level. Social partners do not have their own training facilities aimed at ensuring skills and employment of workers unless they offer training courses for their own employees or members. Training regulation and development is under the responsibility of the Ministry of Education (for general issues) and under the Ministry of Welfare (via NVA) (for training and re-training of the unemployed). The NVA offers several training measures for the unemployed and jobseekers: practical training with an employer; training within the group of measures for increasing of competitiveness of workers; the acquisition of informal education programmes, professional continuing education programs and professional completion education programmes for the unemployed via the voucher method. Training programmes are specified for young workers within the Youth Guarantee programme. Social partners are involved in so far as they monitor the effectiveness of training programmes from the practical point of view and may advise on necessary improvements. Training of the employed is the responsibility of the employer. NVA may assist workers who are at high risk of unemployment by providing career consultations and some training. In the figure, we see a comparison between Latvia and European Union for the workers with 'Age : All' when asked 'Have you had on-the-job training in the last 12 months?'. For the 'No' answer, Latvia's score is higher than the European Union score. For the 'Yes' answer, Latvia's score is lower than the European Union score. Data is based on question 65c from the sixth European Working Conditions Survey (2015). The National comparisons visualisation presents a comparative overview for the values of all answers between two selected countries. For Latvia the European Company Survey 2013 shows that between 2010 and 2013, 49.3% of establishments with 10 or more employees reported changes in the use of technology, 39.6% introduced changes in ways to coordinate and allocate the work to workers, and 21% saw changes in their working time arrangements. The most important Latvian study on work organisation is the Working conditions and risks survey 2012–2013. In the figure, we see a comparison between Latvia and European Union for the workers with 'Age : All' when asked 'Are you able to choose or change your methods of work?'. For the 'No' answer, Latvia's score is higher than the European Union score. For the 'Yes' answer, Latvia's score is lower than the European Union score. Data is based on question 54b from the sixth European Working Conditions Survey (2015). The National comparisons visualisation presents a comparative overview for the values of all answers between two selected countries. Section 7 of the Labour Law provides for the principle of equal rights. Everyone has an equal right to work, a right to fair, safe and healthy working conditions, and to fair work remuneration. Direct or indirect discrimination on the basis of a person's race, skin colour, gender, age, disability, religious, political or other conviction, ethnic or social origin, property or marital status, sexual orientation or other circumstances is forbidden. An employer has a duty to make it possible for people with a disability to work, be promoted to higher positions or gain better qualifications, insofar as such measures do not place an unreasonable burden on the employer. Equality at work must be ensured by the State Labour Inspectorate and the courts if the problem cannot be solved by the VDI. Equal pay for equal work is ensured by the non-discrimination approach of the Latvian labour legislation. In practice, average salaries of women are lower than that of men (by 16% in Q1 2016 according to CSP data), but it has not been proven that women are paid less for the same work. Rather women and men are employed in different types of jobs. For instance, women are more likely to be employed in health care and education where wages are low, while men are more likely to work in the IT sector where wages are high. The same explanation is valid within sectors. For instance, in the banking sector women’s salaries are 36% lower than that of men, because more women are employed in clients’ services while men hold most of the management positions. National studies providing figures on the adjusted pay gap were not found. There are no legislative support measures for addressing the gender pay gap. It is seen to be a problem, but it is not taken seriously by the government or the social partners. Social partner initiatives, if any, are formal and connected with international campaigns. The table below presents the state of play regarding the introduction of pay transparency instruments proposed in the 2014 European Commission Recommendations, c(2014)1405 final. Including equal pay issues in collective bargaining. Equal pay principle is observed, but it does not provide for equal income for men and women. Awareness-raising activities on the issues related to equal pay and the gender pay gap. Quotas do not exist in Latvia, either in legislation or in practice. LDDK (2014), Nozaru sociālā dialoga attīstība un tā šķēršļi Latvijā (PDF) [Development of sector-level social dialogue and obstacles to this in Latvia], Riga. LDDK (2013), Sociālā dialoga tiesiskais regulējums Latvijas un starptautiskajos normatīvajos aktos (PDF) [Legal regulation of social dialogue in Latvia’s and international normative regulation], Riga. LDDK (2012), Darba aizsardzība uzņēmumā. Palīgs jaunajiem komersantiem, online presentation, Rīga.